The 2015 Reds were the worst Cincinnati baseball team in 33 years. They went just 64-98 (.395), which was the worst mark since the 1982 Reds, who went 61-101 (.374). Before that, you have to go back to the ill-fated teams of the early 1930's to find teams who were as miserable as this past year's Reds squad. We could probably end this recap with that statement. Before I move on from last year, however, I wanted to do one last look at the team to see if there was anything positive to glean from last year's statistics. I'm not very optimistic, but here goes. Generally, the Reds were bad at almost everything last year (table, right). On the whole, despite some outstanding individual performances, they didn't hit well and they did not pitch well. Even their fielding, which has been a strength of the Jocketty-Reds, was just league-average last season. The only positive was their baserunning, which was largely the result of allowing Billy Hamilton 454 PA's in center field. The positive thing, I suppose, is that because the Reds finished with the second-worst record in baseball, they get the #2 pick in this year's amateur draft. Small victories. The best thing about the Reds' season was unquestionably Joey Votto. While he was very good in the first half, Votto went on a tear in the second half that was arguably better than any streak thus far in his career. 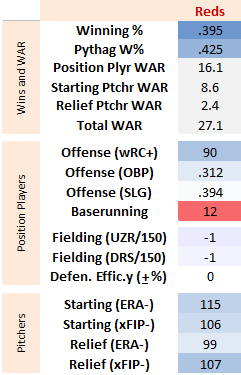 According to both FanGraphs WAR and Baseball-Reference WAR, 2015 was Joey Votto's best season of his career. His counting stats might not have been on par with 2010 levels, but he walked more than he struck out, posted a ridiculous .459 OBP, and had excellent power to boot. Given how pessimistic I was about his future in the preseason, it's hard not to be excited to see him strong and healthy once again. Unfortunately, I missed a lot of it because the Reds were so painful to watch as the season ended. During the first half of the season, the story of the team was Todd Frazier, who had a mammoth start culminated in him winning the home run derby at Cincinnati's All-Star Game. Fun stuff. Unfortunately, he struggled horribly in the second half. And now, he has been traded in a deal that most analysts view as a botch for the Reds. So. Eugenio Suarez was a pleasant surprise. Acquired in the Alfredo Simon deal last offseason, he stepped in when Zack Cozart went down with a very unfortunate injury and immediately became a contributor on offense. He hit for surprising power: with 13 home runs with the Reds, and another 8 with the AAA Louisville Bats (21 altogether), he easily surpassed his previous single-season best of 12 in a season. It was fun to watch, although it's a bit tough to know what to make of him next year. His fielding numbers seemed ok at the start of his stint with the Reds, but as the season went on the numbers reflected some of the scouting questions about his ability to stick at shortstop. Furthermore, his batting line looks a bit volatile: he had only a 4% walk rate, and his BABIP is a bit high for someone who seems a bit prone to pull the ball into the air. Steamer projects him as a 1.9 WAR player next year: a tad below league-average bat, and slightly above-average (with credit for his position) glove. That seems about right. With Frazier gone, most seem to now project Suarez as the Reds' new third baseman. I'm not sure who else could even be in the running. Billy Hamilton was on his way to a really interesting season that tested our notion of how much someone's baserunning and fielding could make up for their complete ineptitude with the bat. Unfortunately, an injury ended his season early, so we didn't get to see a full 600 PA's of that kind of performance. As hard as it is to accept that a 52 wRC+ player might have value, his overall ratings pegged him as a 1.9 WAR player. That's right about league-average, and I honestly think that's correct. Assuming he recovers from his injury, the Reds could do worse than putting him out there every day. Of course, I, like others, wonder if its time to drop switch hitting and just let him focus on swinging from one side of the plate. Apparently, though, the Reds will have him stick with it. I'm not sure that's the right decision. Brandon Phillips recovered to a degree from last year's bad performance, showing a second consecutive season with very limited power (.100 ISO's). Nevertheless, his strikeout rate dropped quite a bit, and his contact rate improved, indicating that he made an adjustment last year, as Joel Luckhaupt has repeatedly mentioned, to focus on spraying the ball and hitting singles now that his power is gone. It might be enough to keep him a useful player over the remaining two years of his contract, which apparently will be with the Reds. What else is there to say? Jay Bruce had yet another disappointing season, and has now posted sub-replacement numbers over the past two seasons. Marlon Byrd, Brayan Pena, and Skip Schumaker are gone, so there's no use dwelling on them. Tucker Barnhart proved a competent backup catcher, which was nice to see. Johnny Cueto and Mike Leake really had to be traded. Leake, you could argue, might have been worth retaining to secure the draft pick. His 5 year, $80-million contract with the Cardinals is verification that he would never have accepted arbitration. But Cueto was worth far more on the open market than the Reds could get with a compensation pick. I'll miss both of them a lot, and I'm not looking forward to seeing Leake or Cueto pitching against the Reds next year. Anthony DeSclafani had a really nice debut season with the Reds. His walk rate steadily improved as the season went on, he maintained good velocity, his strikeout totals were fairly steady, etc. Honestly, I don't think the Reds could have possibly hoped for more. If he can repeat next year, I'll be thrilled. The other nice performance was Raisel Iglesias, who immediately proved that he can get major league hitters out despite his only average velocity. Assuming his body can hold up to the workload of a startup, he looks like a very solid mid-rotation starter for the Reds next year. Michael Lorenzen was the early season darling. Early on, he luck-dragoned his way into a good ERA despite miserable peripherals, and that inevitably caught up to him. He had the best velocity of any Reds starter, but had both control and command issues stemming from a self-confessed tendency to nibble. That might be correctable, or it might be a function of his stuff not being good enough to get out major league hitters. The guy I'm most intrigued by is John Lamb. The rap on Lamb is that his velocity never returned following Tommy John surgery, and as a result his stuff was substantially diminished from his days as a top prospect. Last year, however, he was sitting comfortably around 92-93 mph during his first 7 starts or so, although he faded a bit during his last performances. While his ERA was atrocious due to a very high home run rate (a function, at least in part, to severe flyball tendencies), his xFIP and SIERA were excellent thanks to very good strikeout and walk rates. If he can keep his velocity up next season, he might be a surprisingly good pitcher for the Reds. Also intriguing was Brandon Finnegan. He only made four starts with the Reds, but managed a 20:5 K:BB ratio across 21 innings. The walk rate was a bit high, but his groundball rate was good, as were the strikeouts. Given his pedigree, he'll be one to watch next season. I hope they give him a legitimate chance as a starter, though it seems like there's a sentiment that he belongs in the pen. I hate to give up on a talented pitcher so easily. Aroldis Chapman continued to be ridiculous, and is now equipped with a change-up. It's hard to get too excited about him now, though: he either is looking at a significant suspension due to domestic violence, or he is bound to be dealt. Burke Badenhop was surprisingly bad. He did manage to post a league-average ERA by season's end, but I was so excited about him entering the season. Ultimately, his ground ball rate took a big hit from prior seasons, while his already-low strikeout rate fell even more. He started terribly, recovered to a degree, but was just never the same pitcher the Reds thought they were getting. My guy Jumbo Diaz had a nice second half after what looked like a string of bad luck sent him back to Louisville. Diaz posted outstanding strikeout:walk numbers and great velocity all season long, but a string of home runs plagued him early on. I don't know if that really was bad luck, lapses in concentration, or what. But it was good to see him finish the season strong. He could find himself in a closer role next year, assuming Chapman is out of the picture. The guy who likely will get the first crack at the closer job, however, is J.J. Hoover. By ERA, Hoover had a very nice bounce-back season, posting a 2.94 ERA after a miserable 4.88 ERA in 2014. He also showed a nice spike in his ground ball rate last year, up to 40% after hovering around 30% during his first three seasons. Unfortunately, at the same time, his strikeout rate fell precipitously, while he still walks far too many. I don't see continued success in the cards, which is a bummer because he's reportedly a nice guy. The other big disappointment was Tony Cingrani, who was just wild as all heck. Cingrani will always be an enigma to me. I'm hoping that, with a full offseason of rest, his shoulder will completely recover, and we can see him as an effective left-handed option out of the pen enxt year. Hey, remember when Kevin Gregg was the team's setup guy in April? lol's. So, there you have it. The Reds were bad last year, and they can only really get better next year. Hopefully. They won't have Todd Frazier, but they will have Devin Mesoraco. They won't have a half-year of Johnny Cueto and Mike Leake, but they might be less likely to waste hundreds of innings on sub-replacement starters too. They probably won't get a 7.4-WAR season from Joey Votto, but they can hope for something not too far off. That said, I don't see the Reds being good next year. A .500 season would be a huge recovery from what happened in 2015. That would seem to be the ceiling on next year's squad, but it's baseball. You never know!